Fresh water is fast becoming a finite resource and globally, conservation of water, alongside reducing the polluting impacts of large industry, are critical areas being discussed and addressed. In one key example, it is widely acknowledged that today, textile processing accounts for 20% of all fresh water pollution. Not only is the textiles industry the biggest polluter, it is also one of the biggest consumers of water, using billions of litres per day within treatment, processing and decorating of fabrics. These issues are intensified when considering that many of the major textile production areas of the world such as India, Bangladesh, Brazil, and China face an acute scarcity of water. Whilst not the biggest contributor to this pollution and water usage, textile printing is a targeted area of concern. The textile printing industry is increasingly under fire from lobby groups and particularly the DETOX campaign of Greenpeace. The campaign target is to get leading garment manufacturers and brands to commit to the elimination of toxic and harmful chemicals from the supply chain by 2020. Many leading brands have already signed up to this or have their own programs with the same end goal. These programs and guidelines restrict the use of certain materials both from an environmental and customer contact point of view. Examples of such guidelines and organisations include Oekotex, Bluesign, Inditex Clear to Wear and ZDHC. Compliance to such requirements can be complex but more clarity is offered as some organisations start to recognise each other’s standards and certified partners. Many brands are implementing digital printing technologies, a more environmentally friendly process that doesn’t compromise cost or performance. 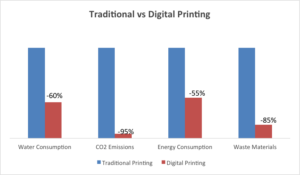 By switching from analogue printing processes to digital, data already shows a huge impact, not only in reducing water consumption and pollution, but also in decreasing energy use, CO2 emissions, waste materials and time. Many complementary studies show an average reduction in water consumption of 60%, energy consumption of 55% and a 95% reduction in CO2 emissions. These clear environmental benefits are further enhanced by studies showing lead-time for printed goods reducing by 80%; waste reduced by 85% and a reduction in the use of chemicals in excess of 90%. Despite these significant benefits, it is clear that the textile printing industry can do more to drive a further improvement. Many printing technologies require the fabric to be pre-treated with chemicals, with the printed design then fixed to the fabric in a steaming process. The energy consumed and CO2 produced by heating water by coal or oil furnace to create the required steam is significant. A subsequent washing cycle (often involving multiple stages) is applied to remove any chemicals and unfixed colour from the textile. It is legally required to treat the effluent water resulting from such processes before release back into the water system requiring energy, time and cost. There are some strong initiatives in water recycling with the first zero discharge factories emerging where 100% of water from each process is recycled and re-used. Today this is expensive, but as more factories adopt such schemes, the price is expected to come down considerably. Limiting the reliance on water supply and treatment opens up the possibility to locate textile mills and print houses in more urban areas, closer to the consumer. This in turn can drive down the requirement for long haul transportation of goods, lowering the CO2 emissions and carbon footprint. Digital printing further supports any transition to more localised production with the ability to print on demand, short runs of any design. Adopting digital printing technologies offers clear environmental and financial benefits allowing the transformation of businesses and represents significant, but not total, progress today. There are opportunities for digital printing to go further and deliver water and chemical free solutions. 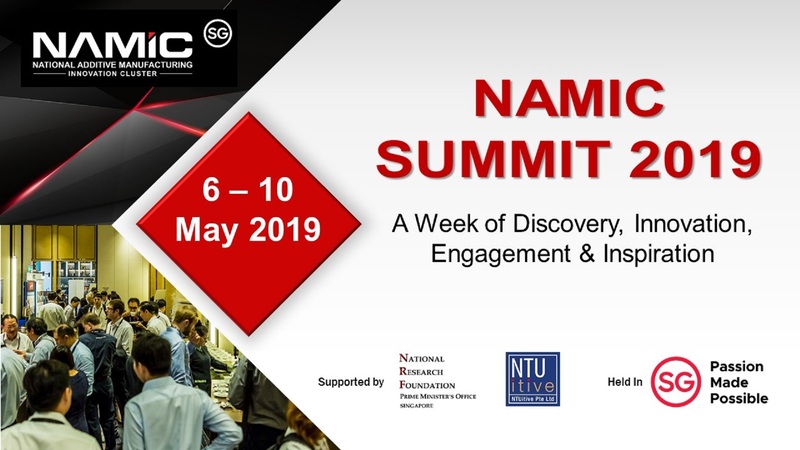 Ink producers and specialty chemical companies can offer significant value in the supply chain and open dialogue with brands and suppliers to ensure compliance to their standards and create innovative solutions to ensure a more sustainable process. An example is Sensient’s pioneering Alpha technology which allows for a large reduction in water, chemical and energy consumption versus direct disperse printing, without compromising the quality and performance of the printed fabric. This is key to driving change. For businesses and brands to adopt more sustainable technologies and chemistries, they cannot compromise their final product. Further developments in pigment printing offer a significant chance to reduce the environmental impact in producing home fashion and Sensient leads the way in developing high colour strength pigment inks meaning no compromise in product visual impact.